Sickness is a universal game-changer. It can humble even the greatest of leaders, it can ravage an unsuspecting community and decimate its population, sometimes people even survive from it! When we try to understand sickness from the perspective of our ancestors, the ill person would develop symptoms seemingly out of nowhere. The pain brought by the sickness lead our ancestors to believe that it must be the work of an evil spirit. Usually that spirit would fully take the mortal life, but sometimes the person would resist and eventually recover to full strength. Let’s say your son was deathly ill and you believed it to be the work of an evil spirit to punish you. Your son survives and you feel as though the evil spirit has been defeated, most likely by a good spirit. So you thank the good spirit and spread word of what it has done for you and your son. The people, with no other explanation, would likely believe your story and seek out a spirit communicator to aid in the recovery of other sick people. The first doctors were, in fact, spiritual leaders. 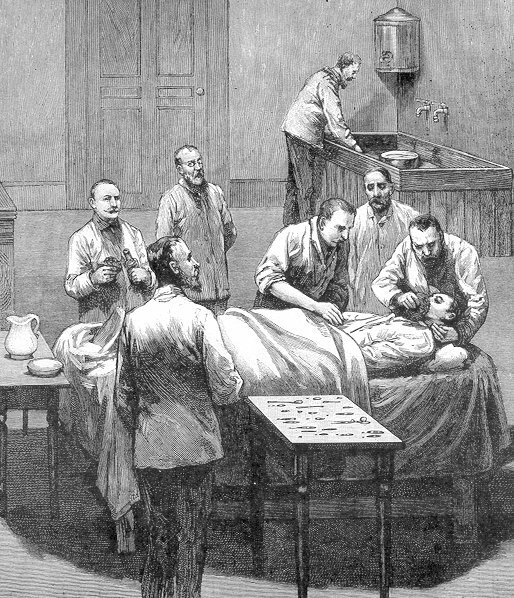 Beyond spiritual rituals, early doctors’ methods were mostly based on trial and error. If a wound on a limb went untreated, the person died. A doctor who knew that would suggest removing the limb. No more limb usually meant no more infection so amputation became a common practice for infected body parts. Early human dissections, like the ones conducted in ancient Egypt, revealed specific organs that were theorized to perform specific functions. They theorized the heart was the source of intelligence and the brain was the life force. With the rise and spread of religion, the body became commonly seen as a sacred object that must remain pristine even after death. The social and moral norms against dissecting humans weren’t enough to dissuade the truly curious, like Leonardo da Vinci, from digging up corpses to learn more. One of the experiments of doctors was the use of fermented sugars or specific plants to numb the pain and even cause the patients to lose consciousness. You might call these medicines alcohol and drugs. The drugs used to sedate or aid in the recovery of sick or injured people were made out of mixtures of natural ingredients. Early surgeries were enacted on awake patients. Fast forward to just a few decades ago, and drugs can now be manufactured and mass produced, a more diverse and growing menu of drugs are now accessible for the public to aid in a variety of ailments. We’ll get back to this in a bit. If you can understand your world, you can control your world: in the mid-late 17th century, we unlocked a greater understanding of our world. We finally figured out that sickness was not a curse brought on by some evil spirit, but it was your body trying to fight back from a tiny, nearly invisible organism living inside your body. We had already seen the phenomenon of advanced immunity toward second exposure as the survivors of a disease would rarely contract that disease again. We discovered that your immune system could remember invaders to be better prepared for the next time they invaded. Doctors used this knowledge of germs to produce a concoction containing a sample of weakened germs known to cause a specific disease. You, as the patient, will easily defeat these invaders and remember them for any future invasion. The concoctions are called vaccines and they have allowed us to conquer the previously invisible microscopic world, ridding the civilized world of most diseases! Current medical science views the human body not as sacred but as a machine like it truly is. We have created chemicals to interact with the mechanisms of our bodies to produce specific effects. We can make you focus, sleepy, hungry, energetic, horny, or relaxed. We can change who you are to the point where you need the changes to feel like yourself. Drug companies develop new products that will target specific parts of your body. The new products won’t even have to compete with other drugs on the market since they will be prescribed by doctors that, in some cases, have been paid to prescribe them. Those drugs, by the way, will cost a fortune because the insurance companies conspire with drug companies to charge whatever they like for medicine. It’s important to understand that we have discovered how to change your body and mind. but it’s also important to remember that we are organisms that do not need these medicines to live in nature. Do not fall to the expectation that a pill can fix your problems because then you start focusing on it instead of you.